Companies of all sizes use JMP every day to make their products and processes better. As the number of JMP users at an organization grows, sharing information about JMP and discoveries made with JMP becomes more important. Let's tackle these two issues separately. At a recent JMP user conference, I asked a number of JMP champions how they planned to share the knowledge they were gaining with other JMP users back home. Most of them said that they had an internal website that they could use. Inquiring further, I found a few recurring features for these internal JMP websites. Provide internal support contact information. Coordinate an internal user group to promote sharing successes and knowledge. 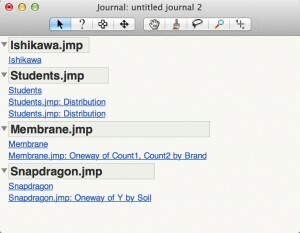 Distribute custom applications in the form of JMP add-ins. Provide links to resources on jmp.com, like www.jmp.com/community. Create a directory of local statistical and JMP expertise. One-stop shopping works faster than a user forum or a literature search. Keep a "wish list" of feature requests for future versions of JMP. You don't need all of these to make an internal JMP website a valuable resource for your user community. Even one or two of them could make a huge difference in the value you get from your investment in JMP. By providing internal discussion forums for posting results of their statistical discoveries or for asking questions about their JMP analyses, you will leverage your most asset: the experiences and knowledge of your colleagues. 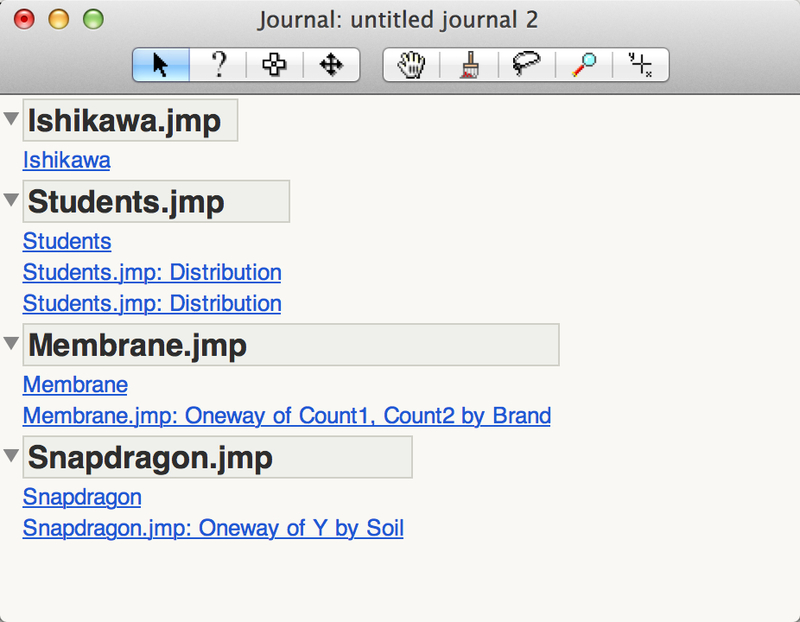 As for sharing discoveries made with JMP, there are a few ways to do this, but the most common is to create a JMP Journal. The Journal provides a simple way to capture, document and recreate the results from your JMP analyses. A Journal lets you save the results from several report windows in a single report window to share with others. You can easily edit or append additional reports to an existing journal. When you give the Journal to colleague, they can see exactly what you've done and even rerun the analyses for themselves to explore further. Does your company have internal Web resources devoted to JMP? Do you use Journals to share discoveries? Leave a comment with your thoughts and experiences on best practices for sharing your information about and knowledge gained with JMP.